Washed, bagged salad greens are perhaps one of the greatest inventions of our modern times. Sort of. It’s completely convenient and easy to dump them into a bowl and dress them for a salad, or into a skillet to saute for dinner. They are clean and crisp, and relatively inexpensive. But when I think of the gross amount of water and energy used to bring those greens to my table, I cringe a little bit. Somewhere out in California or Mexico, depending on the season, those greens were grown, washed, bagged, loaded on a refrigerated truck, driven to Wisconsin, kept cold by refrigeration until they made their way to my house and ultimately my mouth. 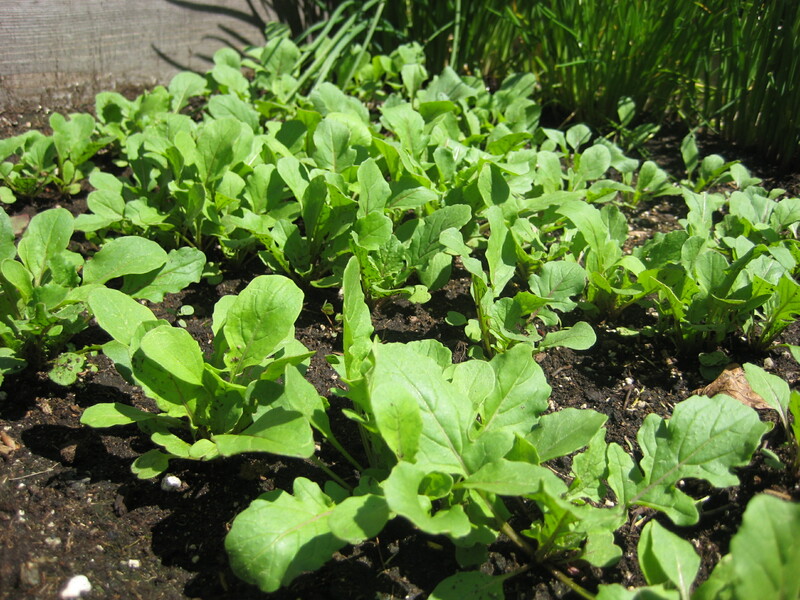 It seems ridiculous because it’s so easy to just plant a few seeds out in my yard and eat fresh(er) greens anytime I want (as the season permits) using virtually a fraction of a fraction of the amount of energy used to bring me those bagged, washed grocery store varieties. Don’t get me wrong: I do occasionally treat myself to box or bag of grocery store salad in the dead of winter. I’m not a purist by any stretch of the imagination. But I am thoughtful about my greens, and thankful I can grow ’em myself 7 months out of the year. I like to grow spinach, arugula, head lettuce, leaf lettuce, swiss chard and will be adding kale to the lineup this year. 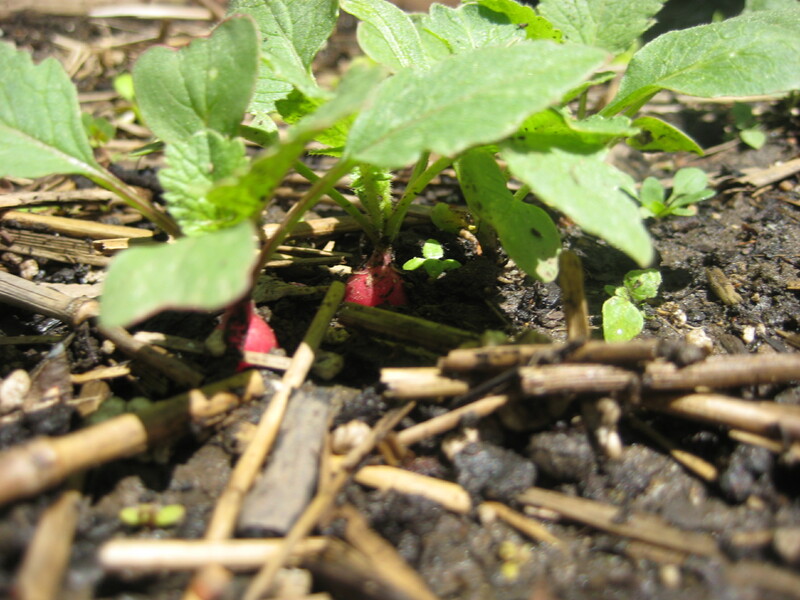 In addition we also eat the tops of our radishes and beets. When I’m ready to make a salad or saute something green, I head outside. Using a kitchen scissors I make quick work of gathering what I need. As I cut, I put everything directly into my salad spinner. 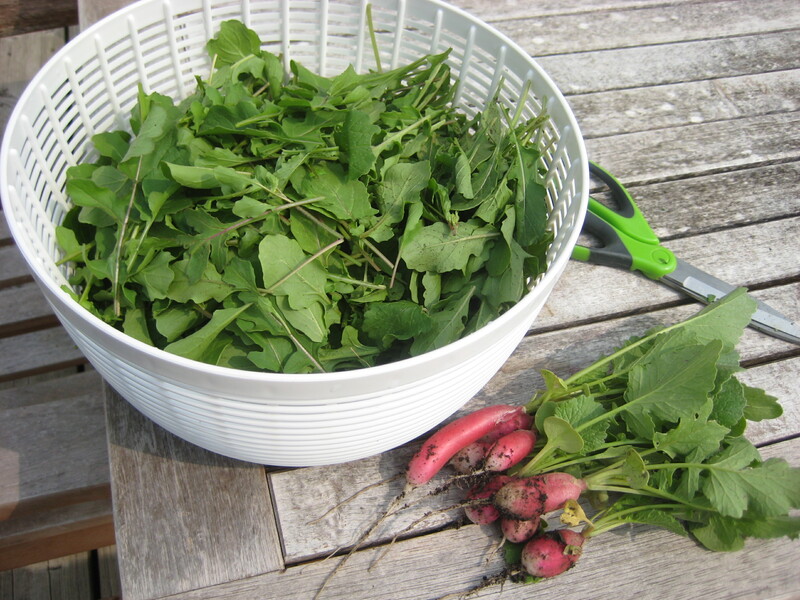 I take the salad spinner insert outside to harvest greens. Arugula fresh from the garden, prior to washing. Once inside I use the salad spinner to bathe the greens in very cold water… this perks them right up and brings them to the perfect temperature for serving. At the same time they are getting nice and clean without the use of machinery or bleach or anything else those big salad growers out West are using. I spin them dry in the spinner and we are ready to use them. When I want to prep the greens in advance of using them or I just have more than I can eat at one time, I store them in a plastic bag with a paper towel in it. This seems to keep them crisp and they usually last at least a week in the refrigerator, sometimes longer. 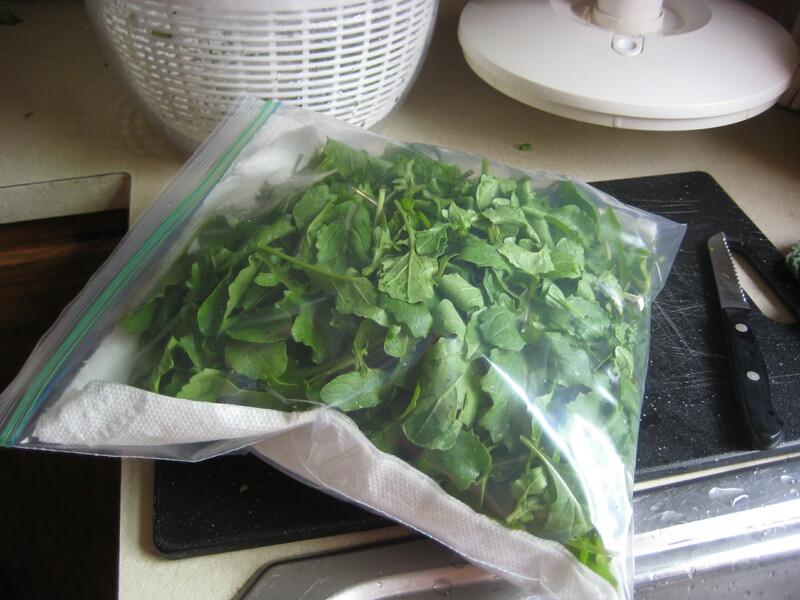 Bagged arugula is ready for the refrigerator. If I discover a more earth-friendly way to do this that doesn’t involve plastic or paper towels I’ll be happy. But for now this works marvelously for me. Now on to a few other items. 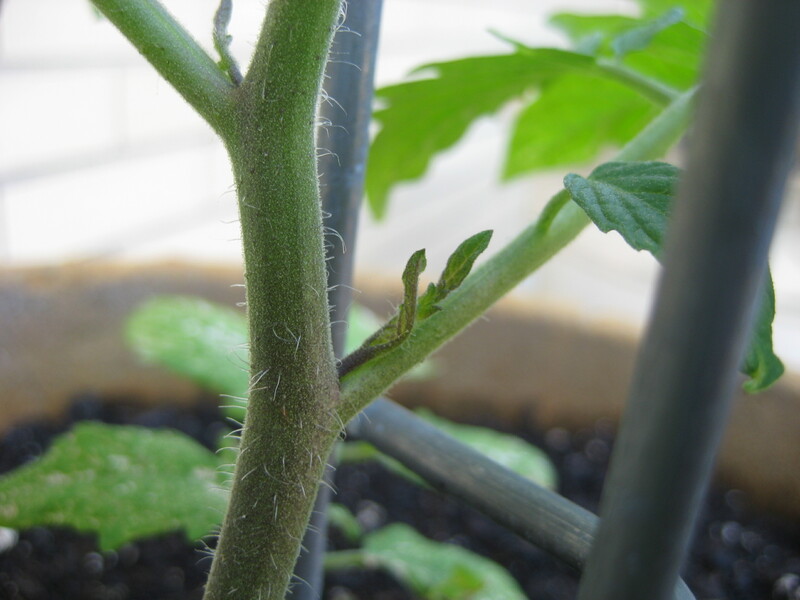 This time of year tomato plants are growing very quickly and putting new leaves, branches and blossoms every day. I am in the habit and pinching off the “suckers” that grow between the stem and branches. It helps to develop a stronger plant. "Suckers" grow at the point where the stem meets the branch. At this size they are easy to pinch off. We’ve also had some excellent bird viewing around the garden these last few days. 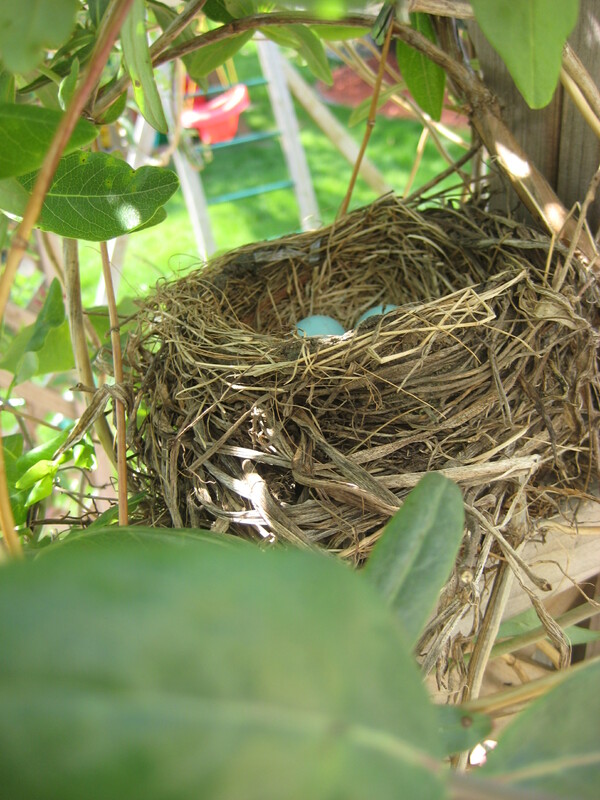 Our robins have been carefully guarding their eggs. I’ve noticed that they take turns, one of them tends to sit on the nest most of the time and when it’s the second one’s turn to be on guard duty he prefers to sit on the edge of the nest or in a nearby location. The fence that hides our air conditioner seems to be a favorite location. This nest is so sweet. It's getting more difficult to see and photograph it as the honeysuckle has filled in. 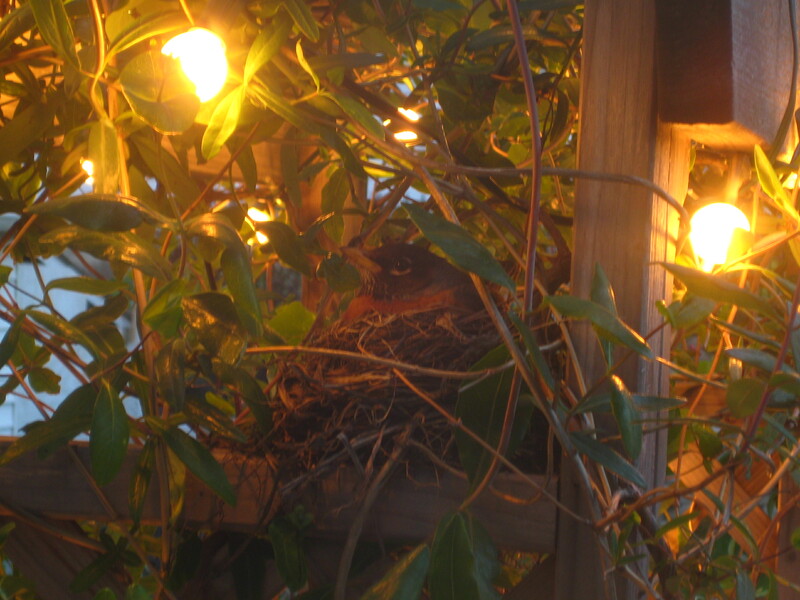 Mr. Robin on his favorite perch at night. He's noticed me taking his picture. 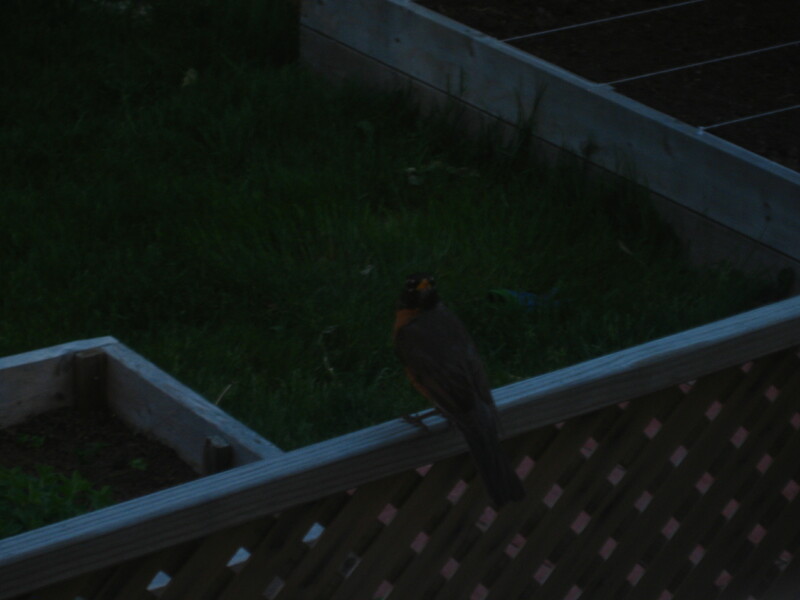 Here is Mr. Robin in the background and the trellis where the nest sits in the foreground. He never lets the nest out of his sight and is quick to run other birds such as cardinals out of the yard. Mrs. Robin dutifully sits. 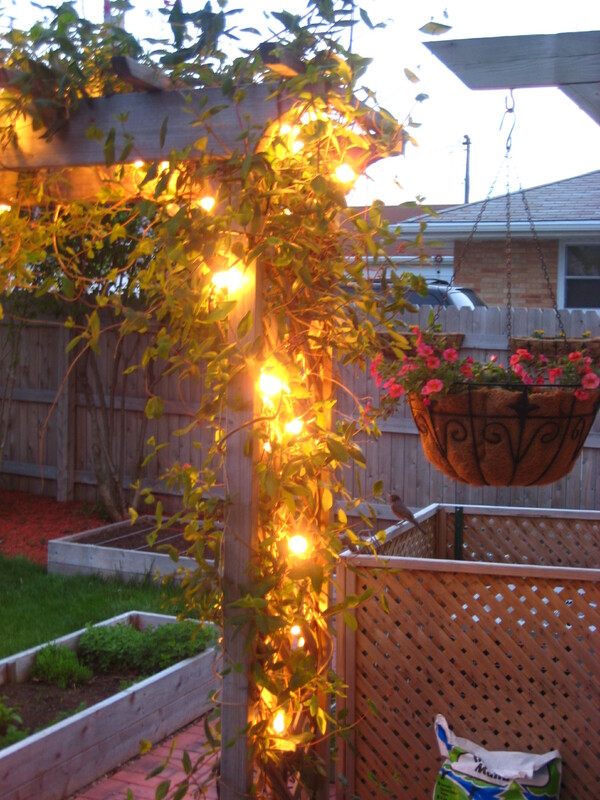 I wonder if these lights surprised her the first night they came on. 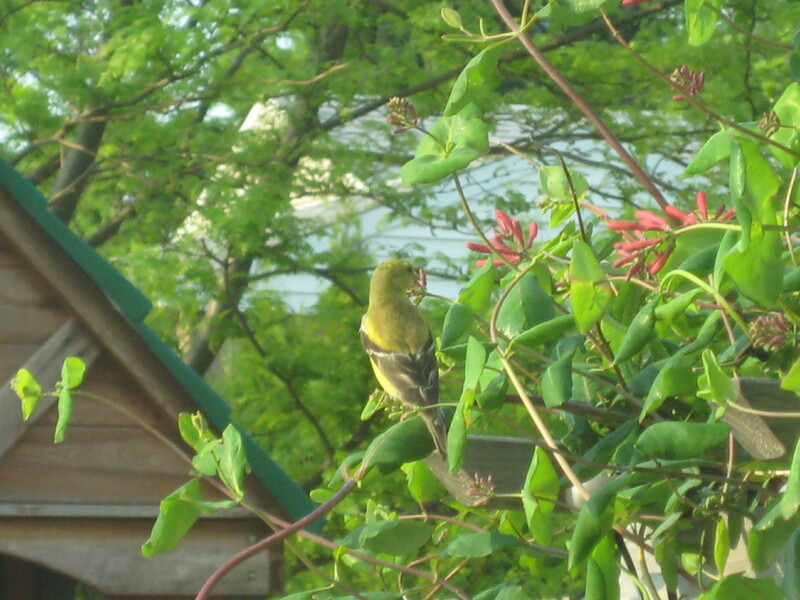 A yellow finch stopped by for a drink at the honeysuckle. I've also spotted hummingbirds here. And finally, I’ve been very busy putting all the starts and seeds into the garden beds this last week. I’m happy to report that (for now) everything is in! There will be some successive planting and late season planting later on, but the big spring dig is done and I’m very pleased with how it’s come together so far. 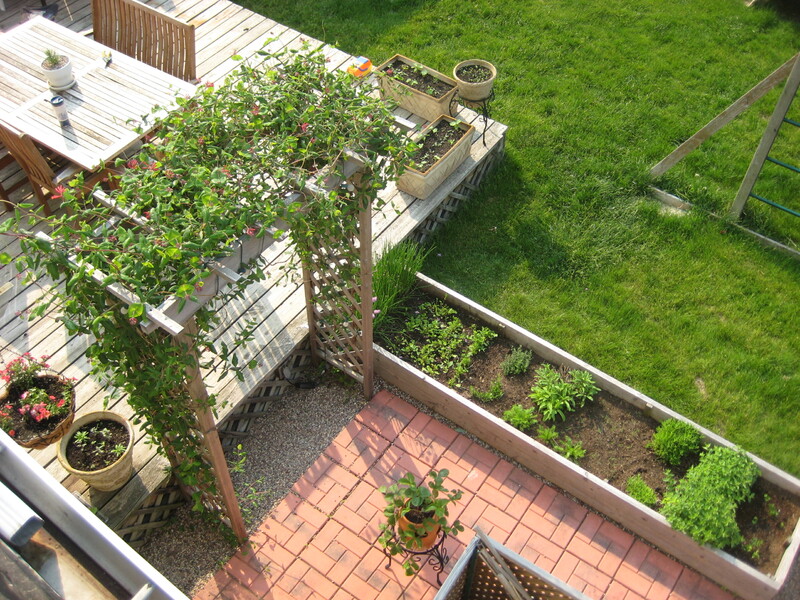 Herb bed and trellis with honeysuckle. 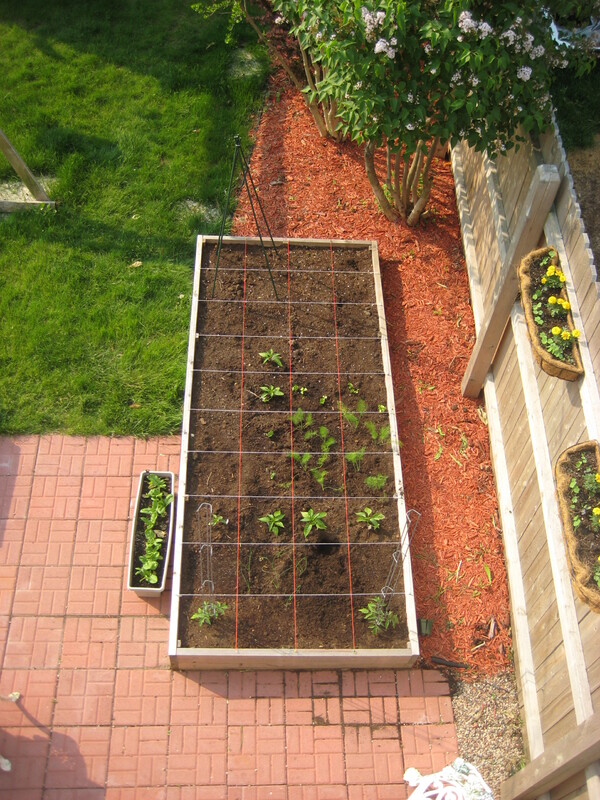 Vegetable bed with the grid still in place. I've planted using a square foot approach this year. Photos from the third week of May. 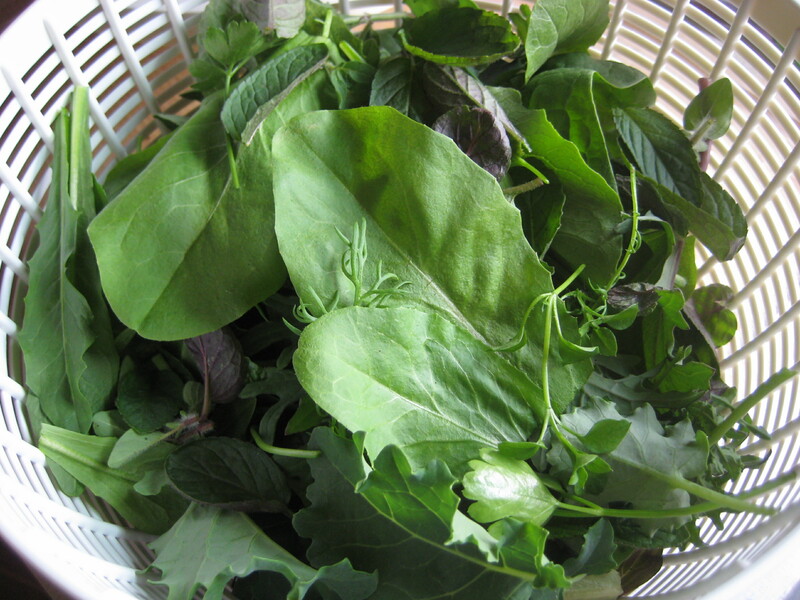 Salad mix just picked from the garden and ready to take a spin in the salad spinner. 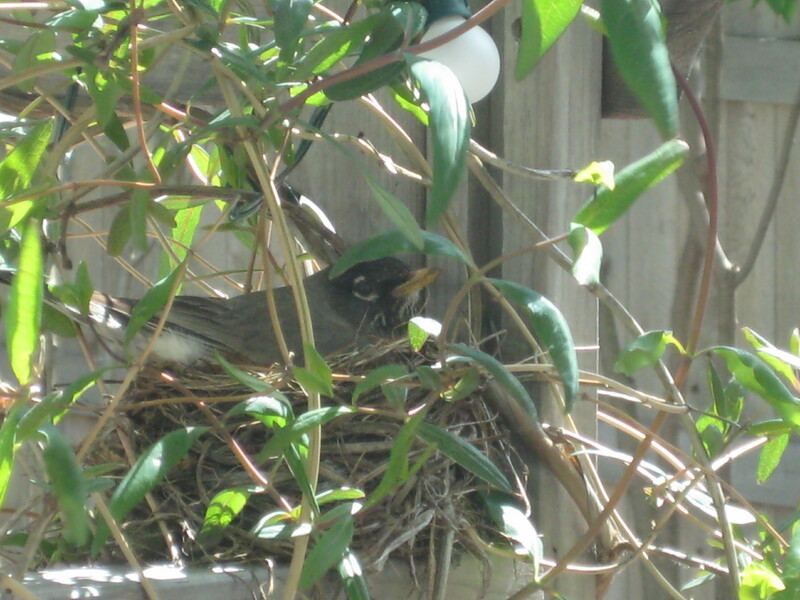 Momma robin has been sitting on the nest quite a bit. 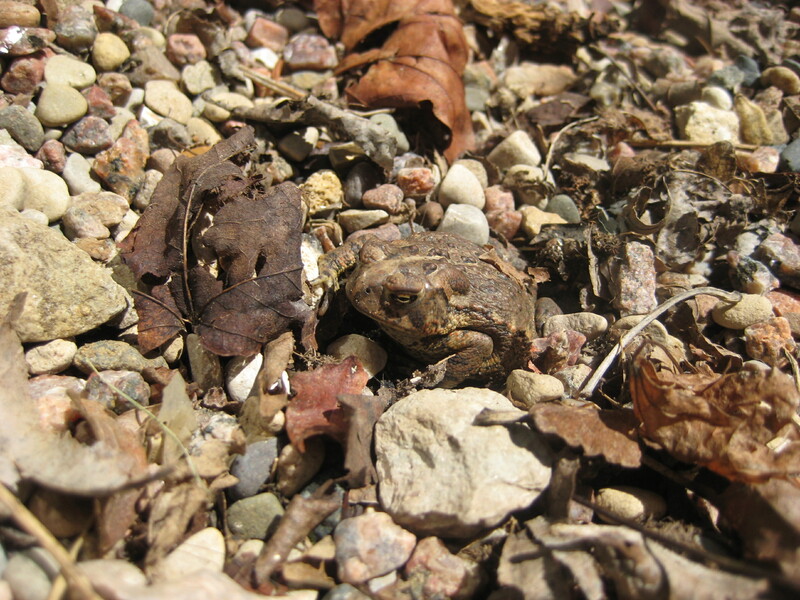 Hidden Picture: Find the friendly backyard insect eater. 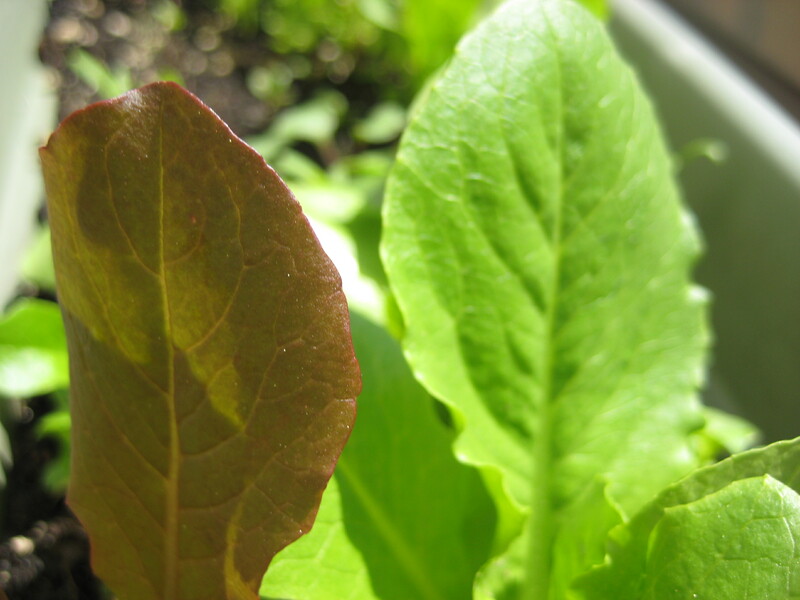 Leaf lettuce right out of the garden is fresh and nutritious. 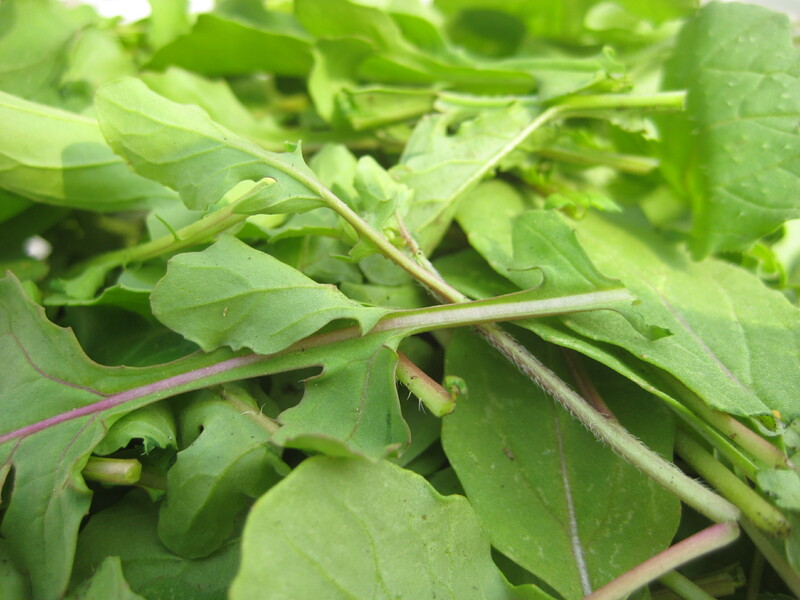 Peppery, bright arugula is one of my favorite things to grow. 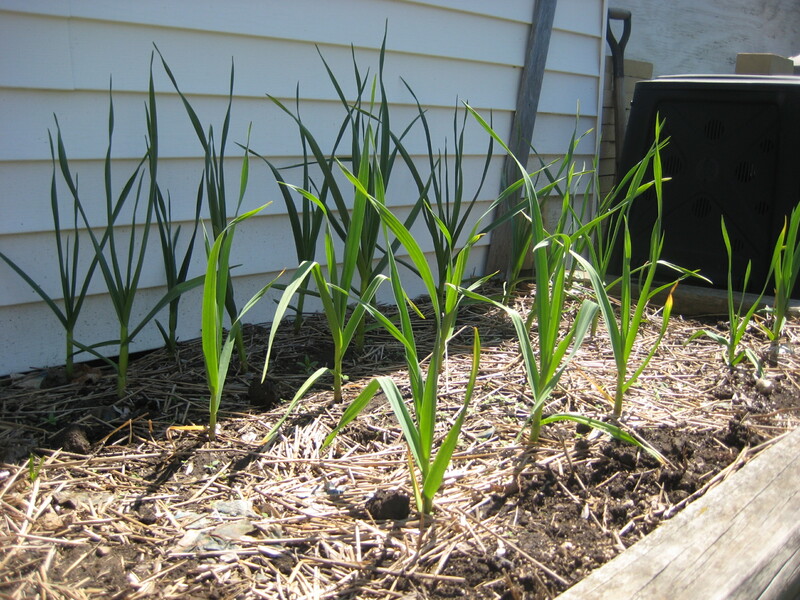 Lots of garlic is doing really well in the garden bed adjacent to the garage.